The changes are part of TxDOT's plan to remove signals at nine different intersections on Highway 360. AUSTIN, Texas — On the back patio of County Line Barbecue, you can enjoy a view of Bull Creek while eating your food. But when you leave the restaurant, “it's backed up that way and this way,” owner Skeeter Miller said, pointing to the east and west of RM 2222. Miller has seen this area transform since the restaurant opened 43 years ago. “There's a lot of density,” he said. “We have a lot of traffic. A lot of new people moving into town." 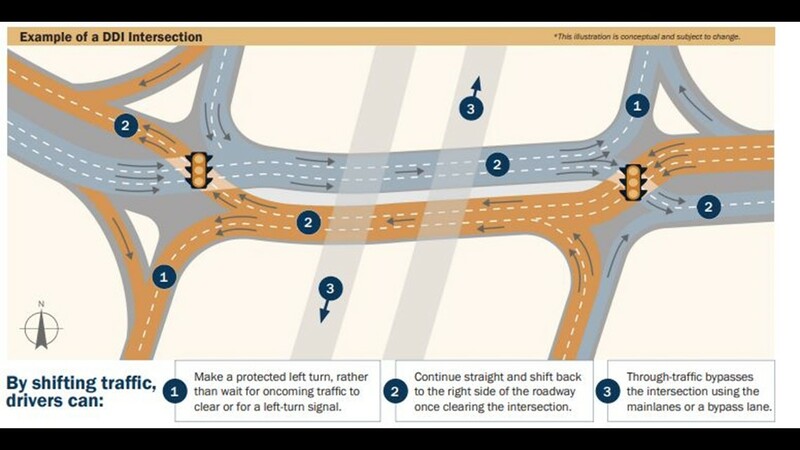 The Texas Department of Transportation (TxDOT) is proposing a new intersection configuration, what is known as a diverging diamond, at Loop 360 and RM 2222. Slaughter and Mopac, along with RM 1431 and I-35 in Round Rock, have this type of intersection. The agency said it will make traffic flow more smoothly, especially left-hand turns. “If they're turning left, they just keep moving,” Bradley Wheelis, spokesman for the TxDOT, said. “They don't have to wait on an arrow or oncoming traffic. That is a free left right there." 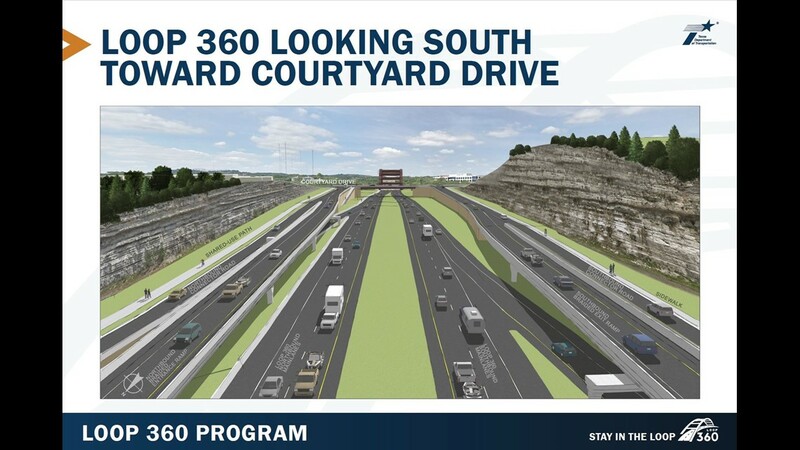 TxDOT said it also plans on getting rid of the traffic light at Courtyard Drive and 360, which is just south of RM 2222 near the Pennybacker Bridge. 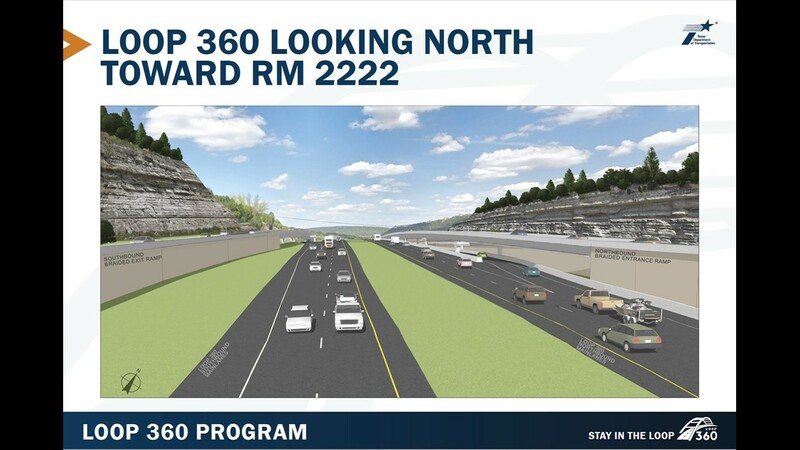 In addition, it is considering a couple new entrance and exit ramps, along with connector lanes and sidewalks for pedestrians and cyclists. "What we're trying to do is eliminate that parking lot that you sometimes get,” Wheelis said. “During the morning and the afternoon." This intersection is just one of nine along Highway 360 that TxDOT plans to change over the next several years, either by removing traffic lights or building bridges to keep traffic free flowing. 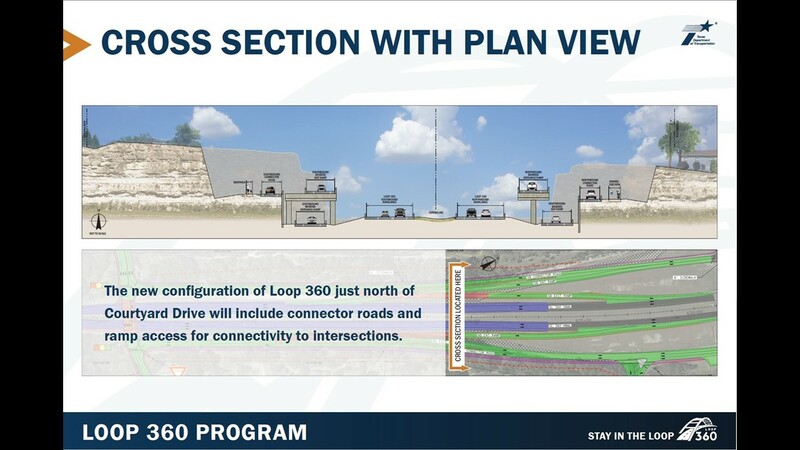 TxDOT said it is considering expanding lanes on 360, but there are no set plans for that. Miller said construction will be a hassle. “These are little painful things we have to go through,” he said. “But, we'll get through it. And we'll be here for another 43 years." TxDOT wants to hear from you about these plans before moving forward. Take a look at the plans more closely here. If approved, construction on this project would begin in 2023 and would cost about $39 million. The agency is still in the planning and designing phase.